Sinjin Hawke & Zora Jones - Vicious Circles. Vinyl LP. Planet Mu. 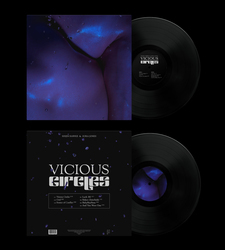 Planet Mu are very happy to be releasing 'Vicious Circles', the debut EP by Sinjin Hawke and Zora Jones, who aside from producing music also run the audio-visual production unit 'Fractal Fantasy'. Zora released several collaborations on last year's 'Visceral Minds 2' including 'Dark Matter' with Planet Mu's Jlin, while Sinjin has collaborated with DJ Rashad, Just Blaze and MikeQ, and also produced music for monoliths like Kanye West and Frank Ocean. 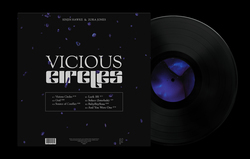 Remarkably, given the breadth of their work, 'Vicious Circles' is their first collaborative EP, and the first time either have released on vinyl. The EP is a great showcase for the duo's emotional, maximalist chimeras of abstract pounding beats. From the punchy, circular, grandiose build-ups of opener 'Vicious Circles', to the unyielding melancholy of 'God' with its sinister Bulgarian choir sample against a peak Timbaland-era rhythm, the record's potent synths and manipulated vocals are simultaneously fierce and friendly. 'Source of Conflict' is a poised dance between pulsing ambient textures and splintered 808s, while 'Lurk 101' pits a volley of abstracted juke toms up against a hammering drum-line. 'BabyboySosa' feels like drum-less drill, manipulating vocals into strange alien shapes before spiralling snares start to form a forceful march. The EP concludes on the love anthem 'And You Were One' with a pitched up vocal running through its chorus of bent sub tones and chimes.